(Nanowerk News) Four papers – two published in Science this week, and two on the preprint archive – independently present evidence that magnetic monopoles really exist in nature. Two of these papers were written by London Centre for Nanotechnology (LCN) scientists. To find a magnetic monopole is a Holy Grail of physics. A magnetic monopole is the magnetic version of a charged particle like an electron, and for the last 70 years physicists have believed that one might exist somewhere in the universe. The monopoles discovered this week are not that Holy Grail, but are the next best thing. Rather than existing throughout the universe, they only exist within a special type of material called `spin ice’. They can be imagined as the north and south poles of magnets, but free to float around independently within the material. However, someone living within in a block of spin ice would think that these are exactly those magnetic monopoles long sort by physicists. The first LCN paper by Fennell and colleagues is a collaboration between the LCN, the Institute Laue Langevin (ILL), Grenoble, and Oxford University. It uses a special neutron scattering technique to image the world in which the monopoles inhabit. This was made possible by recent improvements to experimental instruments at the ILL, funded in part by the U.K. The second LCN paper by Professor Steve Bramwell and Colleagues is a collaboration between LCN, ISIS and Oxford. ISIS is another U.K. facility that in this case was used to produce subatomic particles called muons that were then used as a probe for the monopoles. In this experiment the charge of the monopole was directly measured and found to be equal to that predicted by theory. 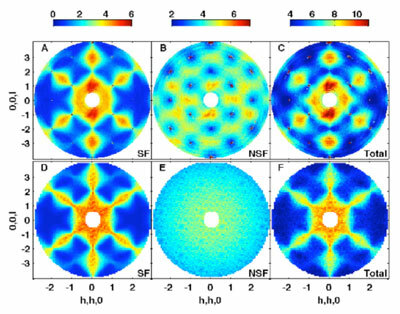 Evidence for magnetic monopoles in spin ice - the bottom row shows predicted neutron scattering data and above is the real data gathered at the ILL, using experimental apparatus that was recently improved by UK funding (the so-called Millenium Programme). The research shows how certain real materials, in this case spin ice, create within themselves things that resemble the basic particles by which the universe is composed. “The amazing thing about spin ice monopoles” continues Prof. Bramwell, “is how perfect they are: they really do look just like those monopoles expected to exist somewhere in the universe. Why nature should reproduce a mini-universe within a material, we do not yet know”. As well as having implications for fundamental physics, the monopoles could be harnessed in the way that electrical charges are, for technology. “A magnetic version of electricity is a long way off” says Prof. Bramwell, “but these results are an important first step”. The London Centre for Nanotechnology is a UK-based, multidisciplinary research centre forming the bridge between the physical and biomedical sciences. It was conceived from the outset with a management structure allowing for a clear focus on scientific excellence, exploitation and commercialisation. It brings together two world leaders in nanotechnology, namely University College London and Imperial College London, in a unique operating model that accesses the combined skills of multiple departments, including medicine, chemistry, physics, electrical and electronic engineering, biochemical engineering, materials and earth sciences, and two leading technology transfer offices.